The experience of college would not be complete without the lifestyle that goes along with it, and many college students choose to engage that lifestyle by taking advantage of off-campus student apartments. ASU is one university with a diverse range of off-campus options in Tempe, Arizona, and a list of the best options in the area is detailed below. Want live close enough to walk to popular bars and to classes on campus near Mill? The Hyve is luxury Tempe apartments near ASU complex that caters exclusively to ASU students, undergrads and ASU graduates. This complex was one of the most popular options in Tempe during 2013, and it rests at the center of all the most pertinent landmarks in the area. They have a number of amenities including a clubhouse, business center, fitness center, pool, spa, barbecue area, and much more. The apartments themselves include wood-burning fireplaces, large closets, upgraded kitchens, vaulted ceilings, and your own private balcony or patio. This urban community apartment complex is one of the more appealing to local students. 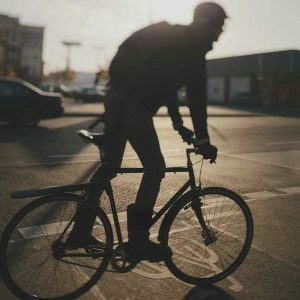 The apartments are just a short ride from the university, and they’re located near Mill Avenue, one of the most popular nightlife areas in Tempe. They have a large resort-style pool, an underground parking garage, a fitness center, a yoga studio, and much more. Each apartment includes granite countertops and an in-unit washer/dryer. 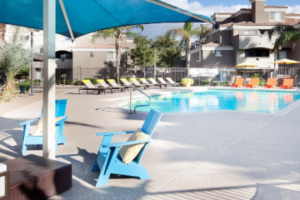 Within walking distance of the ASU campus is ReNue on Orange, a lively apartment community central to Tempe Beach Park and the Mill Avenue area. There are two huge swimming pools, three dedicated laundry facilities, a full library of DVDs, and many more amenities. The apartment is gated for the most secure living space possible, and each apartment features walk-in closets and stainless steel appliances. There are few other complexes in the Tempe area with the same offerings as West 6th. They have an infinity edge pool that is kept heated, a tanning salon, and an outdoor jumbo-tron. Each apartment features floor-to-ceiling windows, granite counters, stainless steel appliances, and a full balcony. They also offer many of the standard amenities for student apartments, like a fitness center and a conference room. This amazing apartment community is only a short walk from the ASU campus, and it offers a number of outdoor amenities that are quite appealing. They have a swimming pool, sauna, hot tub, sand volleyball court, sun deck, free tanning salon, barbecue grills, and much more. Each unit at 922 Place includes granite countertops in the bathrooms, a full-size fridge, a sofa and love seat combo, and a washer and dryer that can be stacked for saving space. The District on Apache is a luxury apartment complex with many world-class amenities, like a lazy river, golf simulator, convenience store, gaming room, and fitness center. Apartments in this complex all come with a wall-mounted HD TV measuring 42 inches, and they also include high-speed internet, granite countertops, and stainless steel appliances. These apartments are some of the most desirable in Tempe. This tight-knit community of ASU students offers a number of on-site amenities that are sure to attract attention. They have a full work center populated with iMac computers, a game room, a hot tub, a sand volleyball court, and a swimming pool. They also provide free tanning beds and a 24-hour fitness center. The complex is fairly close to ASU, and each apartment unit includes stainless steel appliances, dishwasher, walk-in closets, and full furnishings. As another luxury apartment option, Grigio Metro is hard to beat. The maintenance staff is on-call 24/7, and it includes three amazing pools each with their own spa area. A full media library is available for those nights off from school work, and the units come with stunning GE appliances, a private parking garage, and motion sensor lighting. College life is simple and elegant at this highly rated student apartment complex. They have a rooftop sky lounge and three beautiful swimming pools. Each pool also has a spa area for the ultimate relaxation. The apartments are only about a five-minute car ride from campus, and the units have built-in gas fireplaces, walk-in closets, and an amazing view of Tempe. This beautiful off-campus apartment complex features free tanning beds, parking garage, hot tub, volleyball court, basketball court, theater room, and fitness center. The pool is modeled after one you might expect to see in a luxurious resort, and the complex is walking distance to ASU. Units comes with solid black or stainless steel appliances, granite countertops, and included utilities. Student life never takes a break at Gateway at Tempe. The fitness center is open 24/7, they offer free tanning and a well-stocked game room, and their outdoor amenities include fire-pits, a swimming pool and hot tub, tennis courts, and a volleyball court. These units are furnished with faux-leather furniture and wood flooring, and they include wireless internet and private patios. As one of the more affluent luxury student apartment options near ASU, Apache Station pulls out all the stops. They offer free covered parking, a fitness center, clubhouse, gaming center, study room, and sand volleyball court. Their free tanning facility is located near their two giant pools, and both pools also feature a cozy spa area. Each unit comes fully furnished and includes utilities for the ultimate in convenience. It’s hard to feel at home when you’re away at college, but these luxury apartments make it much easier. The modern architecture is alluring and unique, and the complex includes features like a fire pit, tanning beds, pool tables, a full gym, and two crystal-clear pools. The units come fully furnished, and all bills are included in the price of rent. Furnishings include living room and bedroom furniture packages as well as a 40″ HD TV.